Scarface stayed a long time in the Sun’s lodge, and every day went hunting with Morning Star. One day they came near the water and saw the big birds. “What you say is true,” replied the Sun. “I have seen the days and all that she has done. Now I give her to you. She is yours. I am glad that she has been wise, and I know that she has never done wrong. The Sun takes care of good women; they shall live a long time, and so shall their husbands and children. “Now, soon you will go home. I wish to tell you something and you must be wise and listen. I am the only chief; everything is mine; I made the earth, the mountains, the prairies, the rivers, and the forests; I made the people and all the animals. This is why I say that I alone am chief. I can never die. It is true the winter makes me old and weak, but every summer I grow young again. Now Scarface was ready to return home. The Sun and Morning Star gave him many good presents; the Moon cried and kissed him and was sorry to see him go. Then the Sun showed him the short trail. It was the Wolf Road–the Milky Way. He followed it and soon reached the ground. Some young men ran up to the person and said to him, “Why have you sat here all day in the great heat? Come to the shade of the lodges. Great was her gladness then. They were married and made the first Medicine Lodge, as the Sun had said. The Sun was glad. He gave them great age. They were never sick. When they were very old, one morning their children called to them, “Awake, rise and eat.” They did not move. George Bird Grinnell, 1913. Compiled and edited by Kathy Weiser/Legends of America, updated December 2017. 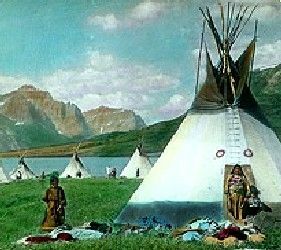 Blackfoot Indians Storieswas published by George Bird Grinnell in 1913 and is now in the public domain. George Bird Grinnell studied at Yale with an intense desire to be a naturalist. He talked his way onto a fossil collecting expedition in 1870, and then served as the naturalist on Custer’s expedition to the Black Hills in 1874. Grinnell was interested in what he could learn from the Indian tribes of the region, and early on, was well known for his ability to get along with Indian elders. The Pawnee called him White Wolf, and eventually adopted him into the tribe. Grinnell was also editor of Forest and Stream, the leading natural history magazine in North America, the founder of the Audubon Society and the Boone and Crockett Club, and an advisor to Theodore Roosevelt. Glacier National Park came about largely through his efforts. Grinnell also spent significant time working for fair and reasonable treaties with Native American tribes, and for the preservation of America’s wild lands and resources.